Traditional unfinished flooring is perfect for contractors or do-it-yourself applications. Available in strip or plank in such a wide variety of species, widths and grades, there is sure to be something appropriate for you. This flooring is a standard 3/4″ thick (19mm). 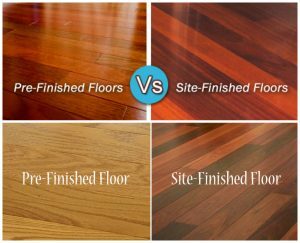 For remodeling, or when finishing on site is impractical, we provide factory-prefinished flooring. This is Finewood Flooring with the same great milling and quality, and the convenience of a prefinished product. All our prefinished flooring is a standard 3/4″ thick (19mm). It has 10 coats of semi-gloss finish with aluminum oxide for long lasting durability. Our Specialty Flooring is unfinished flooring that is 4″ wide or wider. Finewood’s Signature Line is beveled & sanded, making it ready to lay and finish. The sanding mess is done for you! This is available in many species and grades – call us for details and timing. To further complement your floors Finewood provides baseboard, window and door trims, reducers, and rosettes. Feature strips and borders can enhance or spotlight areas in your home. Finewood carries the whole set of components necessary to build your staircase, including stair treads, risers, skirt boards, nosings, and returns. Our cabinet-grade kiln-dried Select Rough Lumber is available in various hardwood species, widths and lengths. Finewood supplies hardwood manufacturing plants worldwide with custom-order dimension stock. Orders are filled promptly and with care. Current specials and promotions available from Finewood. Limited quantities available while supplies last. Check back often!